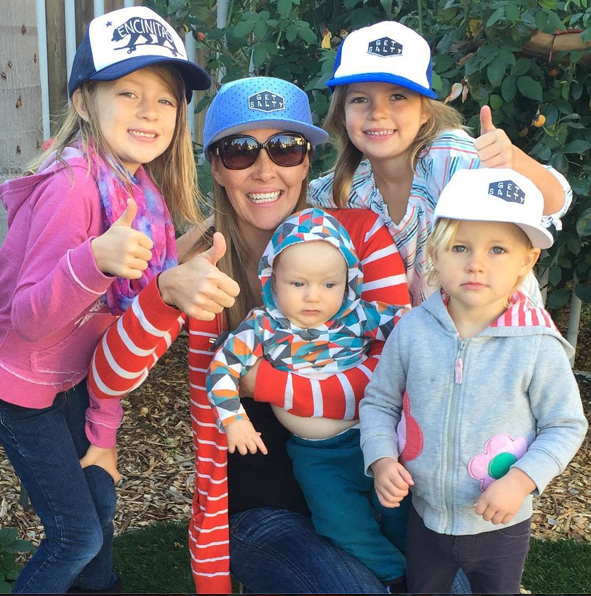 With an instagram bio line of for girls who choose adventure, ride fast & take chances with timeless style & grace – I love Arbor Girls. 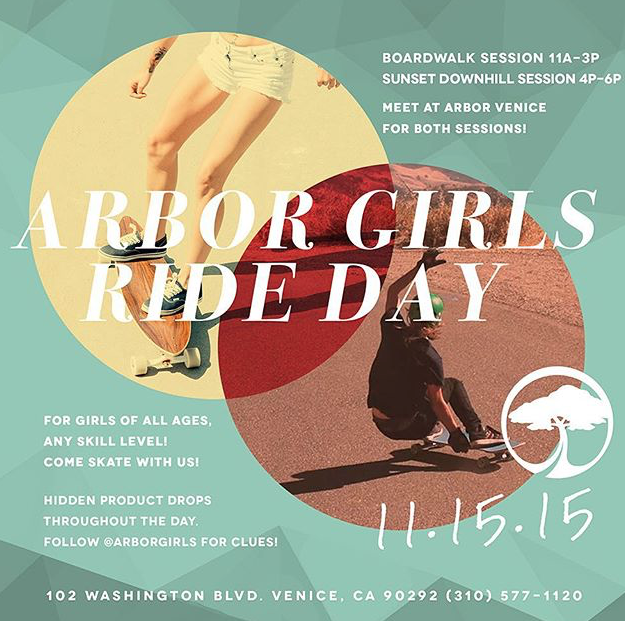 On Sunday November 15th I headed north to the Arbor Venice showroom & headquarters where I met up for an Arbor Girls Ride Day. Similar to the San Diego Arbor Girls Ride there was time for boardwalk/skatepark riding and then downhill. I appreciate these gatherings because it forces me to meet new skater girls. 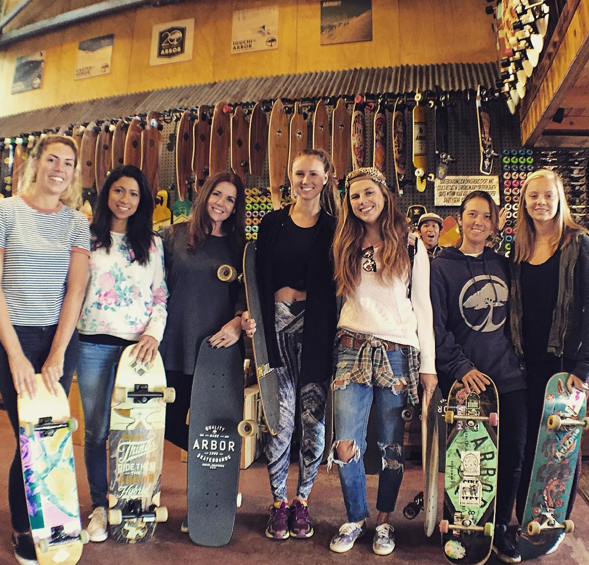 As the skatingfashionista on a mission to get more girls skateboarding for fun – you wouldn’t think I’d ever be shy about talking to another skater girl. You’d be wrong. I can write non stop my verbal skills – not so much. It’s scary to talk to a stranger – you could be alone, they could be alone, there’s so many reasons it could be awkward. So a lot of times I smile at other skater girls and definitely answer back but don’t quite have it to start the conversation. An Arbor Ride Day takes the scary out because you know all the other girls are there to make friends too. 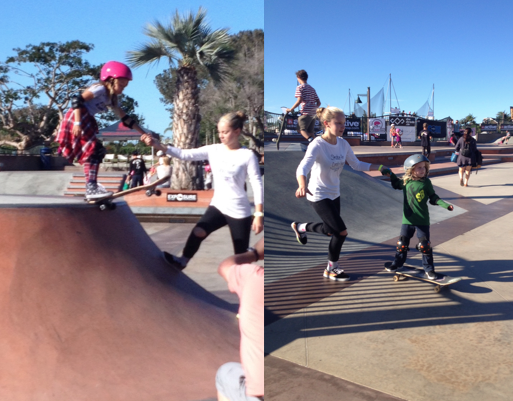 I’m not all about separation – girls skate here & boys over there. I believe we can thrive together – just for me it’s easier to thrive after I’ve met someone in a smaller setting. Especially when I go to a big park or contest it’s easy to feel left out if I’m the “new” girl – everybody already knows everybody and I’m not talking first so it can be a stalemate. Thanks to Arbor taking the time to have events like this I can meet people gradually and then have friends when I go to bigger events. Yes – I can skate alone and be happy – it’s just fun to #ridewithyourfriends so thanks to Arbor and all the other organizations that make friend finding way easier and low stress. Oh and Arbor had prizes – this lucky girl won an Arbor Pocket Rocket. Santa bring me an Arbor Pocket Rocket or maybe an Axis – I’ve been good and will use them for adventure (on a small hill)! Annatheaquarius shares this picture of her favorite little girl. I’m so glad she did and I’m pretty sure she’s the type of girl that inspires other girls to give skateboarding a try! Love the pants with matching laces – who’s your favorite skater girl? We are all stronger when we encourage each other – thanks for taking the time to share! 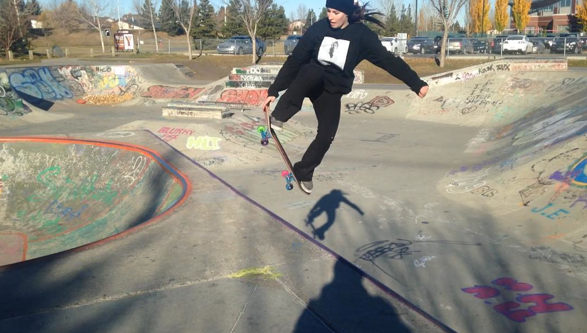 Queenmeag lives in Canada where she loves to Eat, Sleep, Skate, Repeat. I’m so happy she shared & love the colors of the park & the tress in the background. Where are you skateboarding and keeping it stylish – will you take time to share? 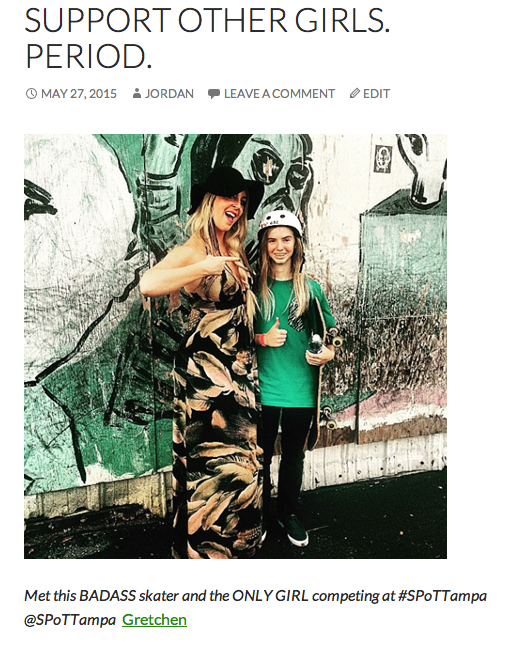 I started this blog because I believe more girls skate when they see girls skateboarding. 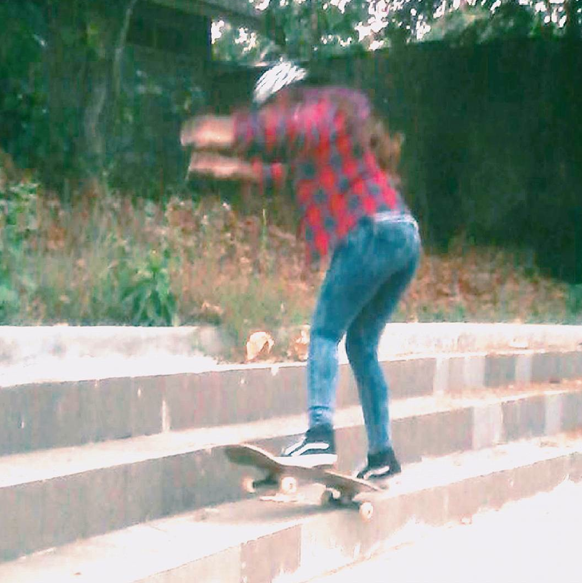 I also believe you can skate for fun even if you’re not a great skater and yes even if you remain true to your style. This year I volunteered to help both EXPOSURE Skate and Poseiden Foundation – I also volunteered my mom. My mom does not skate, she is not a fashion designer – but she is a believer in creating what you want. 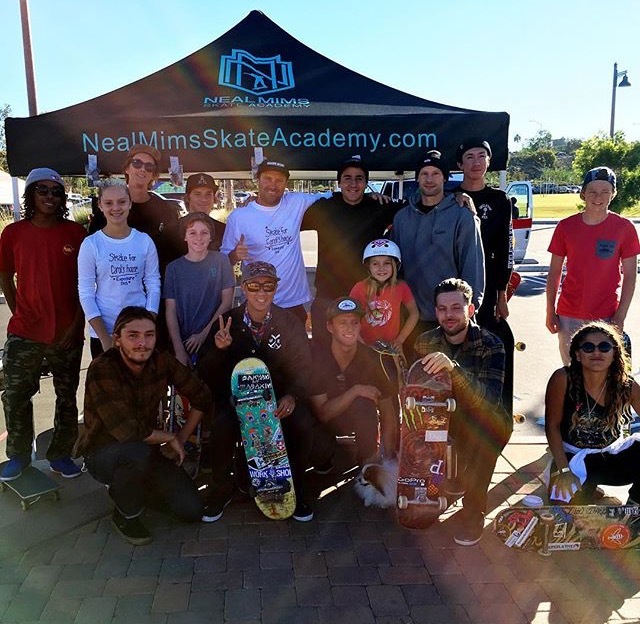 My mom spent hours talking to anyone who would listen why they should have a booth or donate some product because she believes skateboarding empowers girls to chase their dreams. 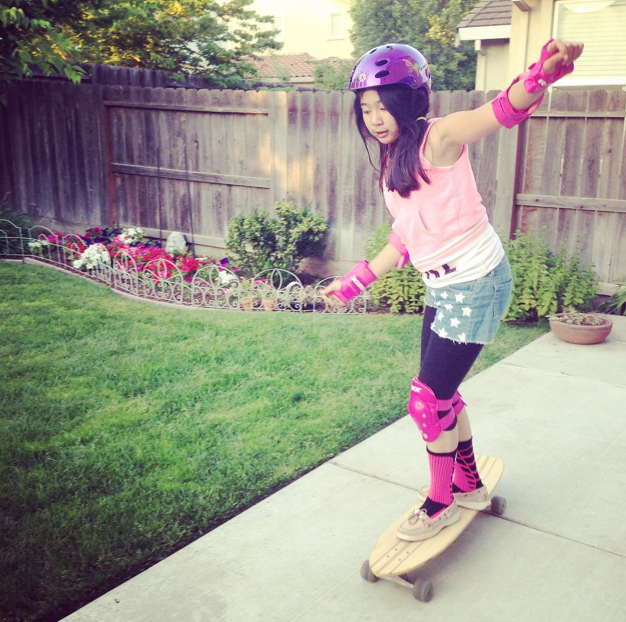 Plus my mom encouraged me to go out and find other girls who skate because they love it. One of the girls I met was Meagan Guy – I first blogged about her in May. 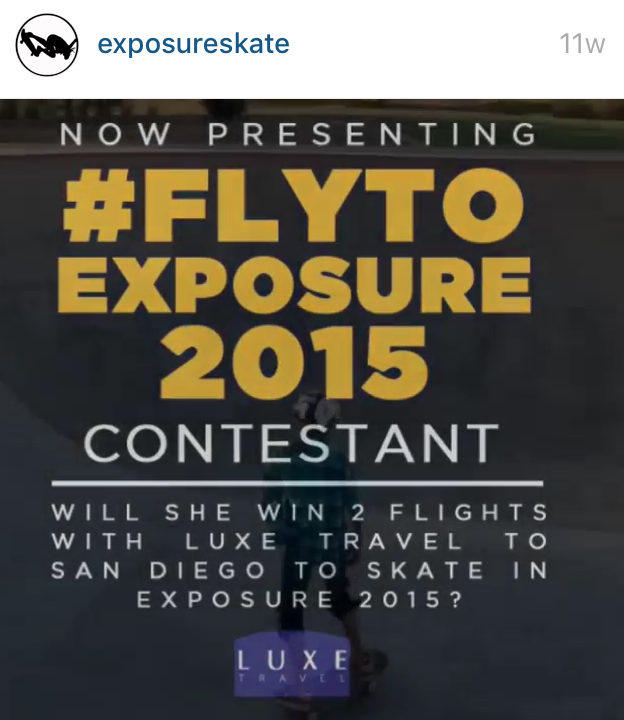 We stayed friends on IG so when my mom landed EXPOSURE some tickets from Luxe Travel. Thank you Luxe. I tagged Meagan on the contest rules. 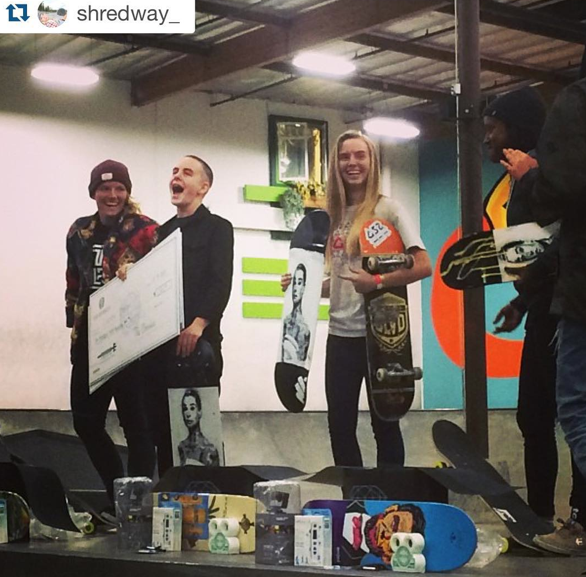 I was psyched because she won and she was coming from Florida to California for EXPOSURE 2015. I want to stress Meagan won because of her video – my mom had nothing to do with who won – she just got the tickets donated. After Meagan was confirmed to come – I made sure she knew the week after was the Poseiden Foundation7th Annual Ladies Day at the Berrics. If you’re all the way from Florida stay a week to skate both events. Her mom must be okay too – because she let her! The crazy part is I never met Meagan – I missed her and another girl, Kori, who I was trying to meet both at EXPOSURE & the Berrics – so I guess I’m not too good with my cell phone. 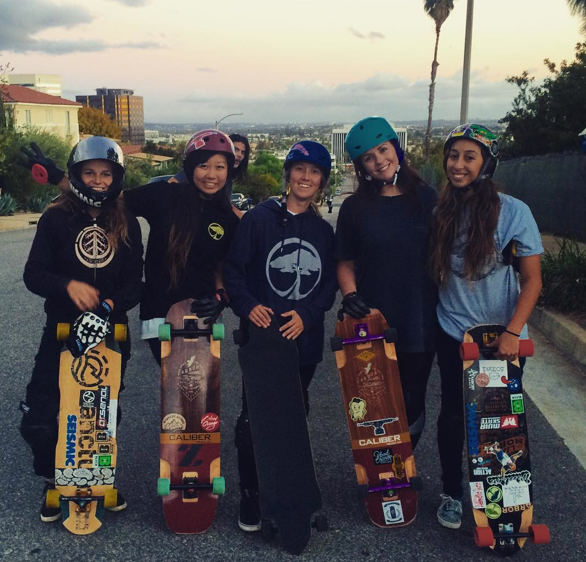 What I am good at is helping other girls encourage each other and know that there is love and support for girls skateboarding. 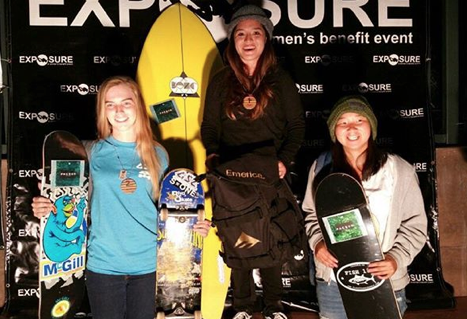 Meagan’s story didn’t end with her trip – she really rips and made podium at both events. My blog doesn’t end here either. I am inspired more than ever to keep on my mission to get more girls skateboarding for fun and keeping it fashionable. 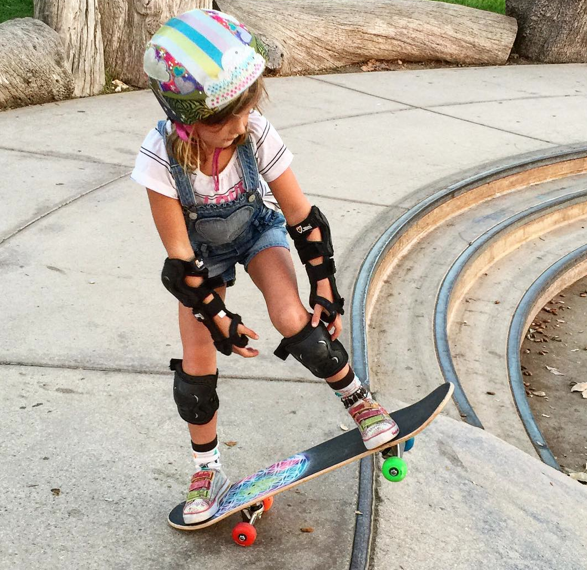 Not everyone can be a super shredder like Meagan – I believe she’s got some God given talent plus a dedication to practice – but any girl can gain balance & self confidence from skateboarding. And all girls are stronger when we work together and support each other. 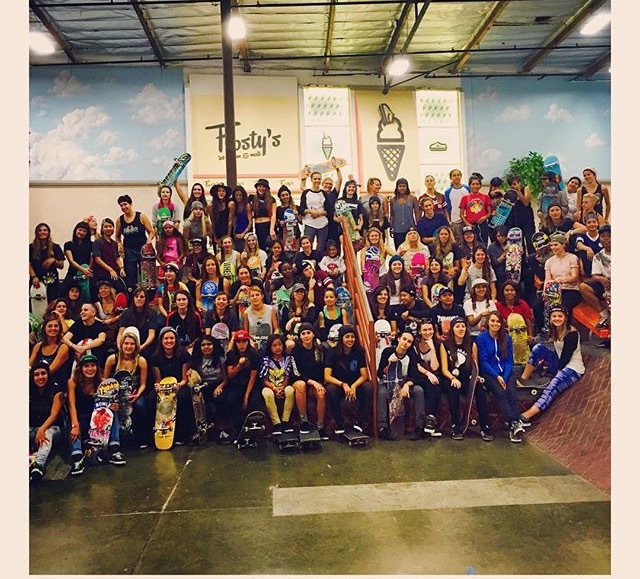 I snagged this picture from johnnyschillereff’s IG – it’s the group shot from Poseiden Foundation7th Annual Ladies Day at the Berrics. And yes – I’m proud to be the one dressed a little differently – NuxUSA blue tie dye leggings – skateboarding should never be about fitting in it’s all about the balance. photo credit & thanks also to girlisnota4letterword, Amy Treadway, Poseiden Foundation & EXPOSURE Skate. Check them and Mahfia-TV to see more photos from the day! 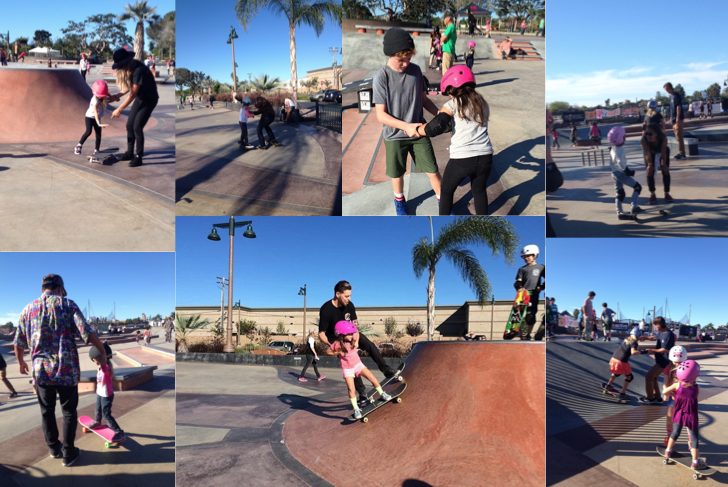 Love to Micaela Ramirez who started Poseiden & made Ladies Day happen, Maya Eve who set up the entire day & all the many others who keep skateboarding fun! Kelsaygroms shares this picture of She’s getting ready and if you check out the rest of their Instagram – you’ll see she’s not alone. 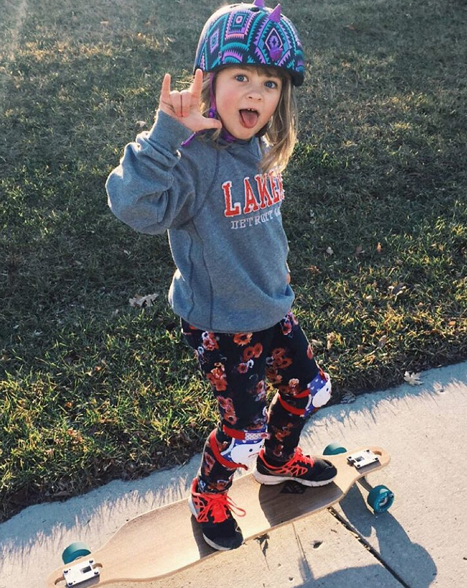 She’s one of three skater girl sisters who one day soon will be showing their little bro how to shred. Who are you skateboarding with? 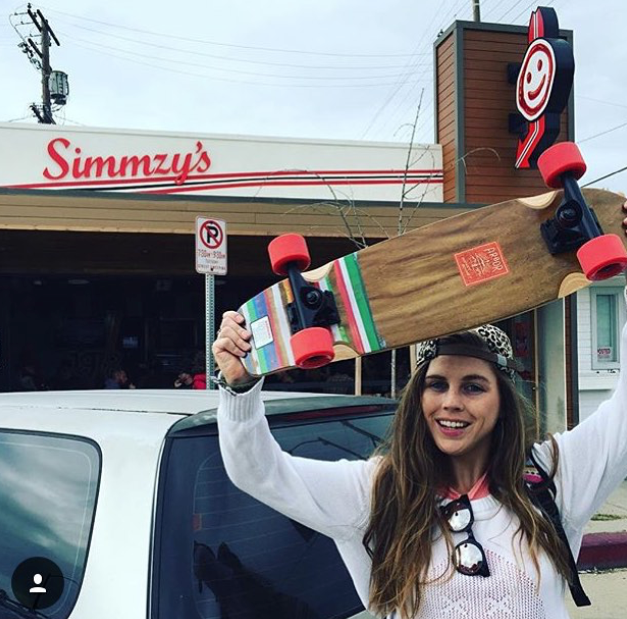 More girls skate when they see girls skating so please share your pictures & stories. 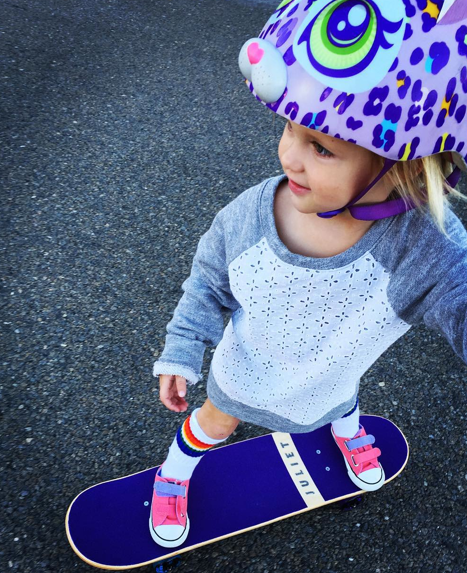 And I love, love, love Juliet’s first board – it’s from SkateXS a local Southern California company that specializes in boards for kids. Just 2.5 and she’s been to an EXPOSURE event and has a board with her name – so super stylish! Carolinetaira666 with a nice 5.0 grind. Where you ask? Did you guess Indonesia? Yes and she’s not alone check out Feminim Skateboarder Indonesia is a FB account for rad girls skateboarding & keeping it stylish. Sophiavagrant shared this rad video of her first drop in. She’s only been skating for 5-6 months – she’s great inspiration that you can start skateboarding when you feel like it. Too many people think skateboarding is for children. Skateboarding is for anyone who wants it and is willing to get out there with a board. Sophia is the creator and designer of Vagrant Life Clothing – trying new things and taking charge both on & off the board is super stylish! Ok I was sold on the picture making the blog when I saw the shorts with stars plus I love leggings under shorts – so the advice just made this even better. Some how it gets in our heads that we can practice and be perfect. If we have any interest in grades we want A’s – if we play a game we want to win – etc. 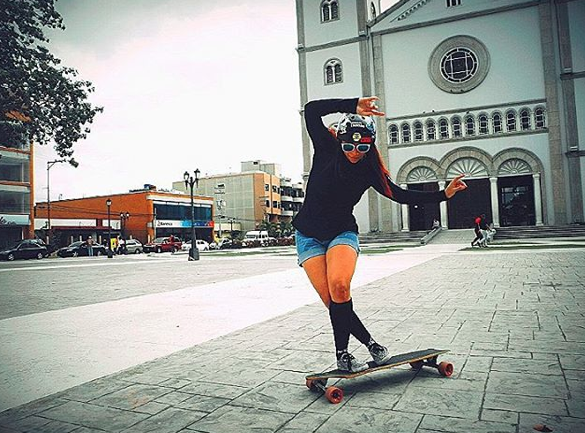 We forget that practice itself should be fun – the time I spend skateboard practicing is fun – if I go on to skate a competition or not does not change the experience of the practice. There have been practices where everything has gone wrong and I still had fun – maybe because I was with friends or whatever reason. I can’t imagine having to practice with the pressure to nail down a trick because I need to have it ready. There’s nothing wrong with setting goals, holding yourself accountable, and challenging yourself – there’s also nothing wrong with having fun and just being present in the moment. Truth is you could land it a million times at practices to bale at a contest but you could also do the opposite so just have fun every time you skate. Be happy with your skateboarding – there’s really no such thing as perfect skateboarding or perfect anything else.